Team sport does more than keep children fit. By cultivating healthy habits in children and ensuring that they stay busy and active, team sport also promotes the physical, mental and emotional wellbeing of the participants. It also provides social benefits. Following are some reasons why parents should encourage their children to participate in a team sport. Fitness: Regular exercise burns calories, heightens immunity, strengthens muscles and the skeleton and helps to establish life-long healthy habits. Children who exercise are generally healthier, with a lower risk of overweight, diabetes and high blood pressure. No place for ‘me’: Sportsmanship and cooperation are more important than ‘me’. Children learn to work together to reach a communal goal – this is an essential aspect of team sport, but it is also an important life skill. In addition, they learn to be responsible and dependable – by just staying away from an important practice session or match, or not pulling your weight, you leave quite a number of people in the lurch. Within the team, friendships are formed and children develop empathy and a sense of camaraderie and intimacy with team mates. Leadership skills: Although team sport is always a team effort, children learn about leadership skills, as leadership is not always about who is the best or who holds a leadership position. It also is about you accepting responsibility and accountability for your role and conduct in the team and to be a role-model for sportsmanship. Self-confidence: When children realise that hard work pays dividends, it will boost their self-confidence and they will work even harder to reach goals. Team sport offers children enough opportunities to exhibit their skills and talents and to experience the results of their hard work. They also feel proud of their team’s achievements and it strengthens their positive outlook on life. Socialising and communication skills: Due to the social nature of team sport children also learn to hold their own in all social situations. It also helps them to cultivate and cherish stronger relationships in other fields. Team sport places children in various social situations where they are forced to express themselves, consequently their communication skills are constantly honed. And because team sport improves their self-confidence, they also communicate with more self-confidence. Respect: Children learn to respect everyone – the coach, team mates and the opponents – on and off the track or field. They also learn respect for the rules of the specific sport and the consequences should they not abide by the rules. Time management: Children learn to manage their time in such a way that they maintain a healthy balance between their sport, school work and family time and also make enough time to relax. Improves academic performance: Research shows that children who are physically active, perform better academically. Through their participation in team sport they learn important skills such as problem-solving, dedication and commitment. They also learn that hard work delivers dividends. These skills filter through to the classroom. For children who struggle academically, a few hours on the sports field can give their self-image the boost they need to once again feel positive about their school work. Alleviates stress and frustration: Team sport helps to relieve stress and for children to get rid of accumulated frustration. Care should of course be taken that the frustration does not manifest in aggression, but that the energy of the frustration is channelled through the practising of the sport itself. 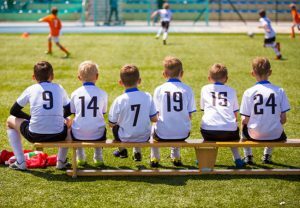 Children can also talk to their coaches and team mates they trust about the stress they experienced at school during the day and in this way relieve tension. To win isn’t everything: Life is not always fair, just like the referee’s decision. Team sport places the issue of win and lose in perspective. Children learn that one cannot always win, but by processing disappointments and reacting to them in a positive way, they grown mentally and emotionally. They learn to work harder, to persevere and also to be patient. The most important is to view each practice, team gathering or match as a learning opportunity and at the same time enjoy their favourite sport.